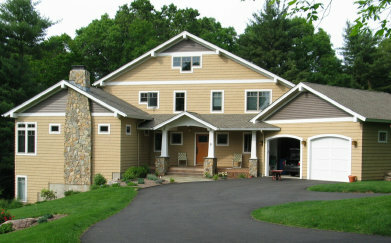 Steve contacted me about building a set of matching windows for his new Craftsman style home in Connecticut. He has two small windows on each side of the fireplace perfect for stained glass. He wanted something Craftsman / Arts & Crafts / Mission style that would blend with the architecture of his home (pictured on the left). 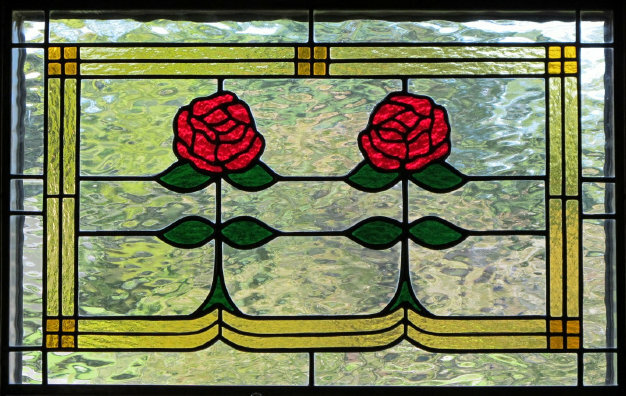 The final drawing replaced the rather plain McIntosh roses with a little more modern rose....but kept all the other classic Craftsman design elements. 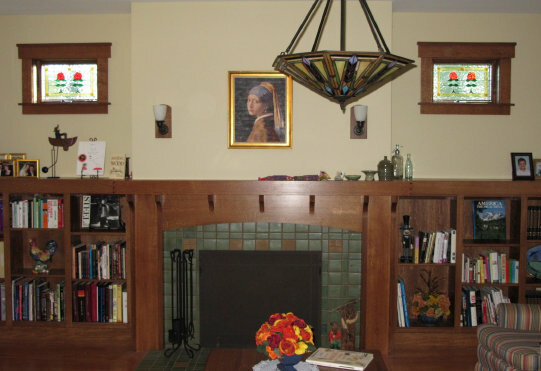 Note, on the right, the beautiful Craftsman period tile fireplace that Steve designed and built himself. He also custom built all the wooden bookcases and window moldings. What a magnificient job! Above is our finished collaboration ....... pure Craftsman styling with lots of color. The clear waterglass allows maximum light with some degree of privacy. Both the dark and light ambers, the green and the red cathedral glass all have rough textured backs. This will cause them to sparkle in the sunlight. Christine's Windows were completed in August of 2012, measure 12.75" x 20", and each contains 93 pieces of glass. Steve sent some wonderful photos of his windows after installation. 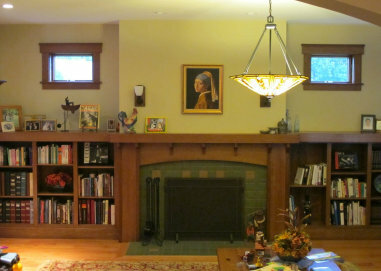 Again, look at Steve's workmanship in this fireplace and all the Craftsman bookcases and moldings. I am proud to have contributed a small part to his amazing project! 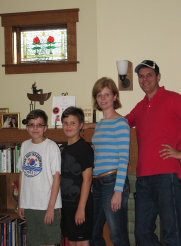 Steve also sent a great photo of his family smiling in front of their new windows.